An interesting way to do something different with your needlepoint is to craft a needlepoint rug. You can make a rug of any shape or size, using any motif you like. Here's a rundown of the basic steps for turning any needlepoint design into a needlepoint rug. Your needlepoint fabric needs to be cut a couple of inches larger on each side than you would like the finished rug to be. Use masking tape to cover all the raw edges so that the fabric won't unravel. If desired, transfer your design onto the fabric. If not, you're ready to begin stitching. Stitch up your needlepoint rug in the same way you would do any other project. It is best to start with the main image of the motif and work your way to the background. Use whatever techniques you like to stitch your design. When you're all stitched up you'll want to block your piece so that it is the desired size and shape. If you want to make this really easy, before you start stitching trace the shape of your needlepoint fabric on a large piece of newsprint or other paper. Cut out the shape and use it as your guide for blocking. Get the piece slightly wet, but not soaking. One way to do this is to spray the project down with a spray bottle. It should be stretchable. Work on the piece with the top facing your blocking board. Tack down one corner of the piece, using your paper as a guide if you have one. Tack the next corner, working around the piece clockwise and stretching as needed. Once you've got all the corners tacked, you can tackle the middle of each side. Eventually you'll have a tack every couple of inches all the way around the piece. Spray the piece again with water and allow to dry for a couple of days. To finish your needlepoint rug, remove it from your blocking board and trim to within one row of the stitches. Use an overcast stitch all around the edge, covering both the blank row and the first row of stitching. You might need to use a couple of extra stitches at the corners to make sure all of the canvas is covered. If you want, you can also back the rug. Backing will make your needlepoint rug a little more durable, but it's not necessary. Good candidates for backing material are heavy cotton, canvas or jute. Pin your chosen backing to the center back of your needlepoint, and then work around the edge, folding the raw edge under. 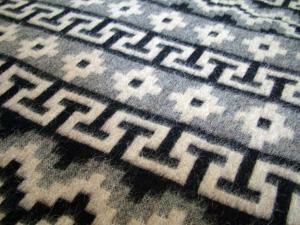 Blind stitch around all sides and enjoy your beautiful, handmade needlepoint rug.